As with most parts of the anatomy, your ears can become sensitive or suffer an allergic reaction to substances resulting in pain or discomfort in the ear. Allergic reactions in other parts of the body can also affect the ears, with consequences to the hearing and balance. When the ears are pierced, it is important that for at least six weeks, an earring made of a good quality metal is used. A lot of people will find that if they use other materials they will become sore or sensitive to that substance. For some, however, even if solid gold, silver or platinum is worn for the recommended six weeks, they will still develop a sensitivity or allergy to other metals. This allergy may arise several years after the metal, usually nickel, is worn without any previous problem.The ear can become itchy and sore, and if the jewellery is not removed and the ear cleaned, can develop into an infection that will need medical intervention and often close up the piercing. How do Other Allergies Affect the Ears? Whatever substance a person has developed an allergy to, can result in the ears becoming affected in a number of ways.This may be presented by an ear infection of any of the structures of the ear, and often if the allergy continues without being treated or the substance being withdrawn, the infection will recur.The infection may be caused by a build up of fluid in and around the ear drum which if not drained can become infected. Pressure can increase in the ear and balance may be affected. The ear can become itchy inside which people will be often tempted to scratch using an implement which can increase the chances of the infection worsening and spreading to other structures of the ear, and increase the possibility of permanent damage to the ear.Research continues to prove compelling evidence that food allergies are directly linked to problems developing within the ears. Many centres and specialists are now offering food allergy testing to determine which products may be contributing to ear infections and other disorders. Many allergic skin disorders such as eczema can affect the ears. 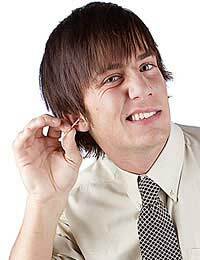 It is important to try and resist picking, itching or scraping the ears during flare-ups of these problems. These actions can cause infection, bleeding and increase the chance of a foreign body becoming trapped in the ear.Always seek treatment for the skin allergy, and ask your doctor for a preparation that will help to reduce itching around the ears.Often, the application of a little olive oil can help soothe dry skin and is kind to ears and will not harm them if a small quantity is applied. The ears are a very delicate organ, made-up of several tiny structures. Allergies can affect the ears in many ways and can be caused by many different products.The most important factors concerning ears and allergies is to determine the cause of the problem and resist the urge to eliminate itching by scratching. Itching inside of ears,sore and swelling of the lobes,I had a course of antibiotics amoxicillin,itching persist it is driving me crazy, please help.